Norwich XI: Ruddy, Martin, Bennett, Bassong, Brady, Redmond, Tettey, Howson, Jarvis, Hoolahan, Mbokani. West Brom XI: Myhill, Dawson, McAuley, Evans, Brunt, Sessegnon, Fletcher, Yacob, McClean, Rondon, Berahino. Norwich's poor form continues. No wins in five now and three straight defeats. The Baggies have back-to-back Premier League wins and another clean sheet. Thanks for your company. Reaction from this game and other matches in the Premier League on the BBC Sport website. Some home fans have had enough as they head for the exits. Three minutes of added time. Still no sign of a Norwich equaliser. West Brom happy to run down the clock. Forward Saido Berahino, who hasn't had his finest game, is replaced by midfielder Craig Gardner. Corner for Norwich. A roar goes up from the home fans. In it comes...Sebastien Bassong is on the end of it but can't keep it down. Groans from the stands around Carrow Road. Where's the fight from Norwich? This is rapidly fizzling out and West Brom are within sight of three points and another clean sheet. The Canaries send on Cameron Jerome for West Hoolahan but is it too little too late? Rickie Lambert is on for West Brom as goalscorer Salomon Rondon heads for the bench after a decent shift. Pats on the back for the forward from his manager. Chris Brunt brings down Wes Hoolahan deep inside the Baggies half. Not only is it a yellow card for the West Brom man, Norwich have a set-piece in a dagerous position. It comes to nothing. The story of their day so far. Time is running out for Norwich. West Brom, as it stands, have moved from 13th to eighth in the table. That's some leap. Jitters on and off the pitch. John Ruddy's pass to Sebastien Bassong is alsmost intercepted by Salomon Rondon. Then Chris Brunt forces another excellent stop from John Ruddy. The Baggies are looking to kill this game off. Wes Hoolahan gets it all wrong as a chance falls at his feet but he can't get his shot away inside the area. Another Norwich move breaks down after a careless pass and the first mutterings of discontent are heard from the home fans. The Canaries continue to enjoy plenty of possession - they can't do anything with it. Norwich are looking to Matt Jarvis to hit back. The left winger is their most advanced player so far today. He's had 29 touches and five crosses, two of which were deemed 'good' by our stats provider. Jarvis is so involved it has seen more than 50% of Norwich attacks coming down their left flank. Very comfortable for West Brom. Norwich have been unable to respond since falling behind. Tony Pulis will take a 1-0 win all day long. Canaries boss Alex Neil orders his substitutes to warm up. A change coming up? It's all gone quiet at Carrow Road. Norwich need to respond if they are to avoid a third straight Premier League defeat. The Canaries remain without a clean sheet in the league this season. What a start to the second half. The Baggies are ahead after a fine move and an excellent finish. Saido Berahino passes to James McClean who produces an excellent cross for Salomon Rondon to head home from close range. Rondon missed a great chance shortly before the interval. He buried that one. Loads of possession and loads of shots but Norwich can count themselves fortunate to still be on level terms. Big misses towards the end of the first half by West Brom's Craig Dawson and Salomon Rondon. Too close to call. Chances galore but no one can put the ball in the net. Back come Norwich. Jonny Howson's crisp strike deflected, Boaz Myhill smothers Dieumerci Mbokani's rebound. The half ends with Salomon Rondon heading a great chance over the bar at the other end. How much did he cost? Norwich are living dangerously. The home defence fails to pick up Craig Dawson following a corner but the Baggies man heads the ball into the ground...and it bounces over a gaping net. He should have buried that. Not a bad game this. Now it's West Brom shirts powering forward. Chris Brunt decides to let fly from just outside the area and his deflected shot is blocked by John Ruddy. What chance is there of a goal before half-time? Wonderful work by Matt Jarvis to whip in a dangerous ball which is met first time by Nathan Redmond but the Norwich striker can't keep it down. Jarvis is causing West Brom real problems down the Norwich left. Norwich are on the attack but Dieumerci Mbokani is flagged offside inside the Baggies area. It's all gone a little flat for the hosts. Just a hunch but I think one goal might be enough to settle this game. Chances are coming at both ends but neither side are in a ruthless mood. Nice by West Brom. A free-kick routine from the training ground results in Craig Dawson fizzing the ball low and hard across the Norwich six-yard area but Salomon Rondon is unable to connect. Norwich are dominating possession. Fast and fluid from the hosts but West Brom keeper Boaz Myhill has still only been seriously tested once. First yellow card of the match - and it goes to the No 8 wearing yellow. Jonny Howson is punished for a late challenge on Saido Berahino. Great spell of pressure from Norwich. They continue to prod and probe the Baggies defence. They need to make this spell count but West Brom are dealing with everything that is being thrown at them. Nathan Redmond is Norwich's leading scorer in the Premier League this season and he is denied a fifth goal as Boaz Myhill makes a smart low save to keep out the striker after a wave of home pressure. The Baggies defence is on the back foot. Both teams are struggling to adapt to the wet, greasy conditions. James McClean gifts Norwich a free-kick just outside the area after a clumsy trip on Dieumerci Mbokani but Wes Hoolahan's set piece is poor. This is developing into a very open game already. Chris Brunt lets fly from 20 yards, forcing Canaries keeper John Ruddy into a full-stretch save to beat it away. First corner of the game and it goes to Norwich after clever work by Matt Jarvis who twists and turns before beating Craig Dawson down the left-hand side. Can Norwich bounce back and record a first win in five Premier League games? Will the Baggies come away with another clean sheet? Pre-match huddle from the Canaries while West Brom boss Tony Pulis is in his trademark baseball cap. We're under way. Here come the teams. 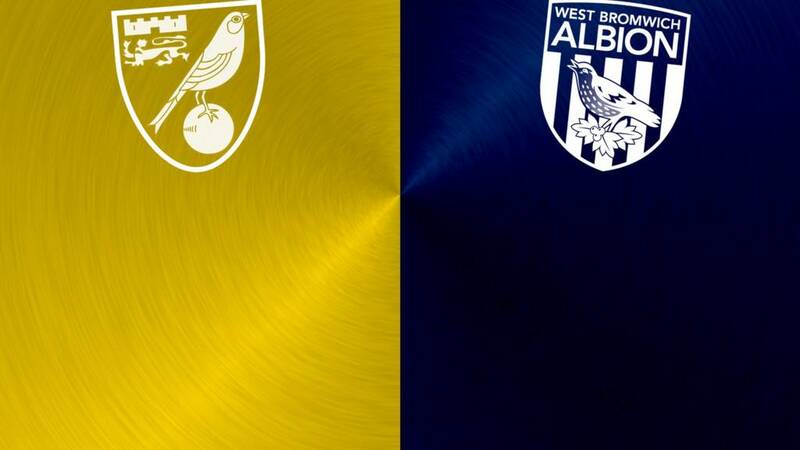 Norwich are wearing their traditional yellow and green while West Brom are in their famous blue and white stripes. Generous applause for the hosts from the home fans after their heavy defeat last week. Umbrellas out, floodlights on full beam, yellow waterproofs everywhere...that's right, it's chucking it down as kick-off approaches at Carrow Road. Ok, it's not quite Hurricane Patricia conditions but it's pretty miserable weather nevertheless. "The controversial nature of Saido Berahino's scruffy winner against Sunderland may have been the chief talking point, but the main headline for me was yet another clean sheet for West Brom. "That's five in nine games already. Tony Pulis is at it again. "In contrast, Norwich are still looking for their first of the campaign. The 6-2 scoreline in defeat at Newcastle may not have accurately reflected the balance of play but it did underline worrying shortcomings in their defending." Quote Message: I was at St James' Park last Sunday to see Norwich lose 6-2 to Newcastle and the Canaries were just a mess defensively. It was not as if the back four and goalkeeper made mistakes to concede those goals, more that the whole team were all over the place all the time. We know what to expect from West Brom, though, because they will keep things very tight They beat Sunderland last time out and, purely based on the evidence of last week from both teams, I am going to go for an away win." I was at St James' Park last Sunday to see Norwich lose 6-2 to Newcastle and the Canaries were just a mess defensively. It was not as if the back four and goalkeeper made mistakes to concede those goals, more that the whole team were all over the place all the time. We know what to expect from West Brom, though, because they will keep things very tight They beat Sunderland last time out and, purely based on the evidence of last week from both teams, I am going to go for an away win." Three changes for Norwich City after their 6-2 disaster at Newcastle. In come defender Ryan Bennett and midfielders Matthew Jarvis and Wes Hoolahan. Out go Steven Whittaker, Martin Olsson and Graham Dorrans. Norwich XI: Ruddy; Martin, Bennett, Bassong, Brady; Redmond, Howson, Tettey, Jarvis; Hoolahan; Mbokani. West Brom name the same side that started the 1-0 win over Sunderland last time out. The good news for Norwich is they are facing a West Brom side which boasts one of the worst scoring records in the top flight. The bad news? Tony Pulis's sides are a dogged and less than charitable bunch when it comes to conceding. The Baggies arrive in these parts with four clean sheets in their last six outings. It's not only the clocks that are going back..so too is Norwich City's season. Wins have become a distant memory - 42 days since the last one - and goals are flying in at the wrong end. Alarm bells might not be ringing around Carrow Road just yet but having been hit for six at Newcastle, it's time the Canaries got three points before the dark nights - and storm clouds - really set in.